I have tried almost every flagship mechanical keyboard out there, and this is by far the best keyboard I have ever used. As someone who bottoms out on every keystroke, the backplate on this board is so solid it feels like I'm typing directly on the surface of my desk, it's amazing. The chassis is very solid and has as small of a footprint as it can have without compromising the layout of the keys. The PBT keycaps it comes with are noticeably shorter than most conventional keycaps, and the side printing gives it a nice clean look (like the filco ninjas). The only downside is that the LED's for CapsLock, ScrollLock, and NumLock are blue, so keep this in mind if you were hoping to colour coordinate with your other peripherals and/or rig (granted, I usually only have NumLock turned on). I've bought the Leopold FC900R from this website and I wanted to share that I'm just in typing heaven. I love it so much that I can't wait to get back to my office (ok, it might also be because my job is alright). The design is very solid and straight forward, with an elegant touch. The keycaps already come in thick PBT, so you wouldn't need to buy a proper set later on. This alone is already a major benefit. I don't know what plastic the case is made of, but it feels awesome. It's got a somehow rough texture on it. But make no mistake, as rough here means: Perfect grip, not prone to fingerprints (and not scratchy). It really adds to the sturdy feel of the whole keyboard. Inside, the board offers a sound dampening mat. With my mech experience limited to some G80-3000, Cooler Masters and a Corsair, I can only say that the Leopold excels them all by far. The sound coming out of the device feels just very rewarding. The kickout stands are fitted with a rubber pad, too. I used a Cooler Master Board that doesn't feature these, that would slip around way too often. No chance for this on the FC900R. The LEDs on caps, num and scroll-lock come in blue. They're bright enough that you can check on them while looking at the monitor. This may be an advantage to some, but to me, it's the only thing that I'd be complaining about the FC900R. Ah yes, the keys: That's just a personal preference. I use the black Cherries with red rubber dampeners. I'd never use clicky or bumpy keys, since I have enough typing feedback from the result produced on the PC. I have always cared about how my keyboard feels, but I did not know about the existence of mechanical keyboards until a few years ago. At that time, I decided to get a Topre Type Heaven. I liked it, but something was missing. 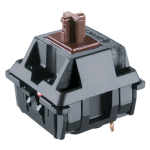 So when it died under mysterious circumstances last fall, I decided to investigate other keyboards, notably the Cherry MX switches. I obtained a switch tester that had Blue, Brown, Black, Red, Clear and Green switches along with O-rings in two different thicknesses. I expected to like either the blue or brown the most and thought I would not like O-rings. In the end, though, I found I liked blue switches with the thinner O-rings the most. I decided on the Leopold FC980M, but unfortunately, there was some kind of incompatibility with my hardware, and I ended up with this model instead, thanks to the great customer service at Mechanical Keyboards. What's in the box: the keyboard, obviously. Also, there is a very generous USB cable. In addition to the keyboard and cable, there is a PS/2 adapter, some extra keys (space bar, scroll lock, and caps lock), and a plastic key puller. I had not expected the key puller and had also bought a wire key puller, but I found I actually preferred the plastic one that came with this keyboard. Aesthetics and construction: This is a very solid keyboard with an elegant and sleek look. The rubber pads on the bottom of the keyboard and on the riser feet keep the keyboard firmly in place on my desk. The key legends are a light grey and on the fronts, rather than tops, of the keys, which makes them very unobtrusive. The Leopold logo and tagline are minimal. Finally, the indicator lights for the lock keys are on those keys themselves and they are blue in color. I didn't know that, but it matches the rest of my system perfectly. Typing experience: I do both typing and gaming, but I bought this keyboard primarily for typing, and it excels here. I don't think I have ever had as pleasurable experience typing as I do with this keyboard. I was correct to get the O-rings, as I discovered that without them, I only bottom out some of the time, which made the bottom-clack sound very jarring and disruptive. On the other hand, I love the sound of the click of the blue switches, and the activation force is perfect. The feel of the keycaps themselves is also very nice -- very smooth, with a slight texture. The indicators for the home row index fingers are obvious and helpful. Overall, it looks and feels fantastic, and I hope it lasts a very long time. I think this is the best keyboard I have ever used. I also highly recommend Mechanical Keyboards, as their customer service is top notch.